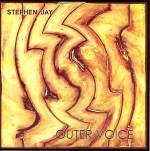 Stephen Jay's fourth solo CD "Outer Voice" is now available. In blending 8 and 12 strings basses with percussion from around the globe Stephen Jay and his long time collaborator Pete Gallagher unleash a musical force previously unknown to the planet, that does exactly what it wants, lives it own life, and turns on a dime. Featuring new explorations of poly-metric funk "Outer Voice" catalyzes the syncopation of time into something completely new, every time. The actual musical nuts and bolts combine sympathetic organic nuance with the great unknown to create a field of response possibilities involving a living musicality whose function as a psychic mirror is as natural as it is invisible. See what you hear. As an added bonus "Outer Voice" features the late Joe Higgs (often called the father of Reggae) performing vocals on the track, "Secrets of Freedom". Recorded in the 90's when Stephen was Joe Higgs bassist this "lost" recording of one of Reggae's greatest voices sat in the can for nearly a decade before being rescued, re-mixed and re-mastered for this album.